Telelisting can automatically export your lists of phone numbers to your Sales Dialer dialer. This will allow you to dial your phone numbers automatically. In order to export from your Telelisting Phonebook to Sales Dialer, you will require your Agent Name. Select the following link to go on the Sales Dialer website and to register: http://www.salesdialers.com/. When you will subscribe to Sales Dialer, an Agent Name will be created for you. This Agent Name will be used to login to your account. Login to your Telelisting account. Select your name in your Telelisting menu and select ‘Settings’. Once you will be on your settings page, simply select the ‘Dialer’ tab. 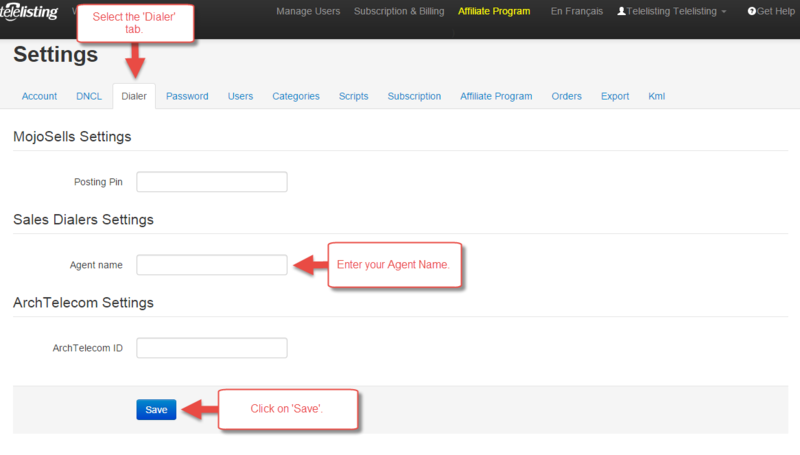 Enter your Sales Dialer Agent Name in the second box and click on ‘Save’ at the bottom of your Telelisting page. Once your Agent name has been saved, you will be ready to export your lists of phone numbers! To export a list of phone numbers to Sales Dialer, simply select the ‘Options’ button of your Telelisting Phonebook and select ‘Export Sales Dialer’. We recommend you to wait 5 minutes before opening your file on your dialer in order to make sure that the export has been completed successfully.